Finances are somewhat of a taboo conversation subject, but if you’re considering cohabitation or marriage with your man, it’s a must. Check out top tips for creating a financially harmonious relationship. Don’t wait until your man empties your joint chequing account for a new pair of tire rims to bring up the subject of finances — instead, lay out a few ground rules before you even visit the bank. The conversation should be calm and low-key, but be honest about your spending habits and financial personality. For instance, are you more of a spender or a Scrooge? Lay it out for him right off the bat. Keeping track of who spends what is essential, and not just because you’ll know where to lay the blame when that important cheque bounces. It helps you budget, lets you know where your account stands and gives you important insight into your spending habits. For instance, you might not realize that you spend a small fortune at Starbucks every month when you’re always paying by debit. Separate credit cards allows each of you to maintain your own credit history. This might not be important right now, when your finances are good, but in the future or in the event of a split, death or financial difficulty, tying your credit history to someone else could ruin your rating and make it difficult to take out a loan or mortgage. Avoid surprises — like having your natural gas suddenly cut off in the middle of winter — by making one person responsible for paying the bills. That way, you’ll avoid a confused monthly scramble to figure out what’s paid and what’s not. If you want to share the task, divide the bills up — for example, he’ll pay the utilities and you pay the cable. 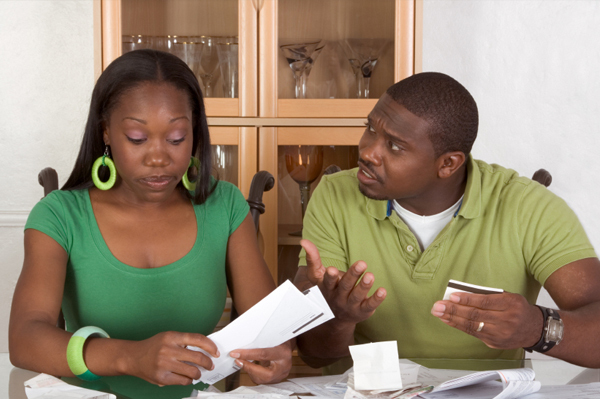 A study by the National Endowment for Financial Education found that, in one in three couples who’ve combined their finances, one partner has deceived the other in some way regarding money matters. This includes keeping hidden bank accounts, lying about debt or hiding bills from their partner. Don’t be part of that statistic — be upfront and honest with your man about your spending and encourage him to do the same. You never know what life can bring and it’s important to be prepared for the worst. If you’re having trouble just making ends meet without even adding saving to the equation, it might be a good idea to seek out a financial counsellor to help the two of you come up with a budget.